Any type of cat illness can have a huge impact on the health of your cat. That's why it’s so important to be aware of all the possible signs and symptoms, and to know how to prevent them from getting any worse. Though it's always essential to go to your vet when something is wrong, there are alternatives that may help you in a situation where a vet is not accessible. Here's a helpful ebook full of Home Remedies For Cats (& Dogs) that could prove invaluable if you need to address a health related issue at a time when you cannot access a vet. Some cats will be in noticeable pain when trying to use the litter box. If you notice your cat whining and crying, you find blood in his urine, or your cat is having accidents and taking excessive numbers of trips to the litter box, he may have an infection. Take him to the vet immediately to have him checked out. Your vet will do tests to determine if a urinary tract infection is present. The most common treatment given by vets is a course or shot of antibiotics. This is the first step in making your cat well again, and if it has been caught early enough, the infection can be cleared up. If the infection is not caught and treated early enough, there could be complications, such as having the infection spread into the kidneys. This will cause your cat tremendous amounts of pain. If blockage occurs this can prevent your cat from urinating, and can be life threatening. Like their human owners, cats too can catch colds. If you have an indoor cat that doesn't go outdoors, it is highly unlikely that he will get an upper respiratory infection (URI). This type of cat illness is contagious, and is spread by an infected cat coming in contact with another cat. If your cat isn't eating or drinking, or is less active, this can be a sign that he is very ill. In this situation it’s crucial to seek medical attention from a vet. This type of cat infection is caused by a virus, so when taken to the vet they will give him antibiotics. The antibiotics are given to hold off the start of any other infections from forming. There are some medications your vet can give that will help break up the mucus in your cat, which will help breathing easier for your pet. In some severe cases, if your cat has become dangerously dehydrated, the vet will give him a fluid drip to try and tackle the symptoms of this cat illness. This is caused by a virus, and is also referred to as Feline Distemper. Kittens are at the highest risk of catching this terrible disease. It is contagious, and is commonly spread through the use of a litter box, or by consuming contaminated food and water. You therefore need to be very careful if you have more than one cat in your home. If you have a suspicion that your cat may be infected, you should see your vet immediately. There are no medications that can be given for this type of cat illness. There are antibiotics however, that are used to fight off any other infections that may result. When making a diagnosis the white blood cell count is tested and the symptoms are noted to confirm that your cat has Feline Panleukopemia. This infection is very hard to fight, and many cats end up dying from it. There is good news though – a vaccine is now available to prevent your cat from becoming infected. This is more common in older cats, and is generally due to the natural aging process. When kidneys start to fail, waste is unable to be removed from the blood stream. When kidneys become worse, more water is needed to process toxins. 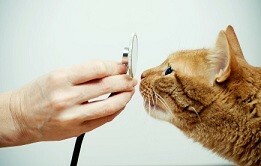 By taking him in, your vet will give a blood and urine test to see if your cat is indeed having kidney failure. Though there is no known cure, there are some treatments that can be given to help prolong your cat's life. An IV drip, or dialysis is the most common kind of treatment. This helps filter out the toxins. Diabetes occurs when there is not enough insulin produced to maintain proper blood sugar levels. If a diagnosis is not given in time, a cat will not live for very long. As diabetes progresses to the more advanced stages, your cat will becomes less active, and his coat will become dull. Ketoacidosis happens in some cats. This is a complication that happens when there is no sugar in the body for fuel. Blood and urine tests are given by the vet to determine if your cat has diabetes. Treatment includes using insulin shots once or twice a day, and maintaining a special diet. If your cat is dehydrated, he may need to be treated for this.